Showcase your collections in style with our large selection of displays sets! 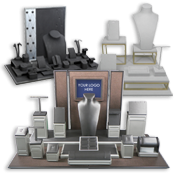 Shop the best sets for your store, from white & black leatherette sets to burlap & wood pieces. Sets can include pieces such as pendant, ring & necklace displays, earring trees & pillows. Get the best prices thanks to our wholesale deals and freshen up your store's look!